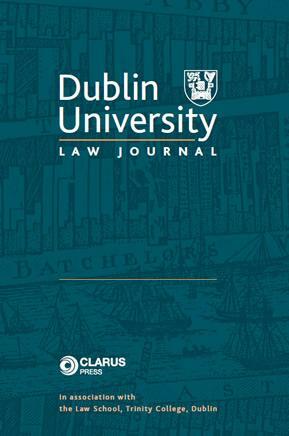 The Dublin University Law Journal is published by Clarus Press on behalf of the School of Law, Trinity College, Dublin. It is a leading peer-reviewed legal journal, publishing authoritative, critical and scholarly analysis on a broad range of legal issues. It provides a forum for important legal academic debate on contemporary Irish law as well as developments from further afield in the common law world, in European and international law, and in legal theory. The journal publishes longer articles providing in-depth analysis of a wide range of legal issues, as well as shorter articles, comments and case-notes providing up-to-date analysis of recent developments and book reviews providing critical assessment of important legal publications. The Dublin University Law Journal thus provides accessible and balanced coverage of a wide spectrum of current and enduring issues in law and legal scholarship.